Technology + Partnering together are today’s business imperative. They are redefining and rewiring organizations and what it means to be a leader. Partnering is happening everywhere, requiring collaborating internally and externally—at all levels and across all functions—with unprecedented speed, scale, and scope. It is apparent to leaders now: digital transformation doesn’t happen without robust partnering capability. How will you create, deploy, and integrate a leadership system for collaboration from top-to-bottom and end-to-end, overcoming organizational boundaries, inertia, and old ways of leading? 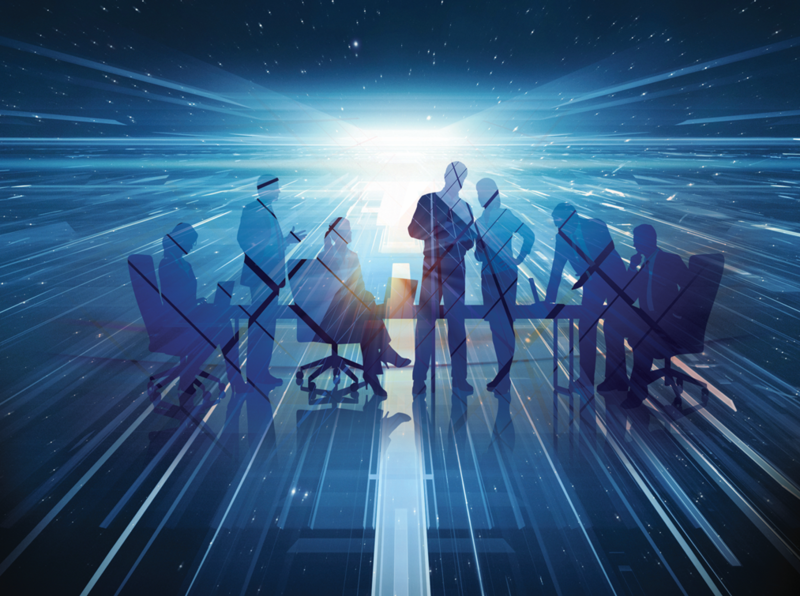 The SMART Partnering Alliance of The Rhythm of Business and Alliancesphere offer a five-point collaborative leader’s transformation agenda— a roadmap for creating your organization’s leadership system for a rapidly changing digital world. In 2016, former US President Jimmy Carter announced that he no longer required treatment for his metastatic melanoma that had spread to his brain and liver. After six months of being treated with the immunotherapy pembrolizumab (trade name KEYTRUDA), together with surgery and radiation therapy, doctors had seen no sign of his disease for three months. This was a remarkable development—before pembrolizumab was approved in 2011, President Carter’s cancer likely would have been fatal. Known as a “checkpoint inhibitor” pembrolizumab and other drugs in its class work—in simplest terms—by turbocharging the body’s immune system so that it can fight cancer. Its success, and the success of other similar drugs, such as avelumab (trade name BAVENCIO), and nivolumab (trade name OPDIVO), have unleashed a tsunami of clinical collaborations to identify how using these drugs in combination might expand and extend their significant patient benefits—and maximize their value to the biopharma companies that are developing them. 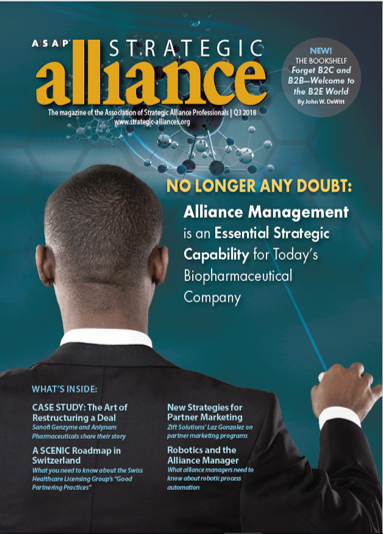 Based on The Rhythm of Business’ research, there is no longer any doubt that alliance management is acknowledged at the highest levels as an essential strategic capability in today’s biopharmaceutical company. How will you continue to resource and evolve your alliance management capability to keep pace with the scientific and business changes hurtling at the industry that are in turn driving the need for more and more partnering and externalization? We offer you our recommendations for how an essential function keeps pace with demand in this mini e-book. Don’t miss our article about what we’ve learned through the research in the Q3 2018 issue of Strategic Alliance and check out our narrated presentation of the preliminary results from the research. It has been said by more than one executive that having too much work for her team to manage is a “high-class problem to have.” If you buy that thinking, biopharma alliance executives have a very high-class problem to cope with! 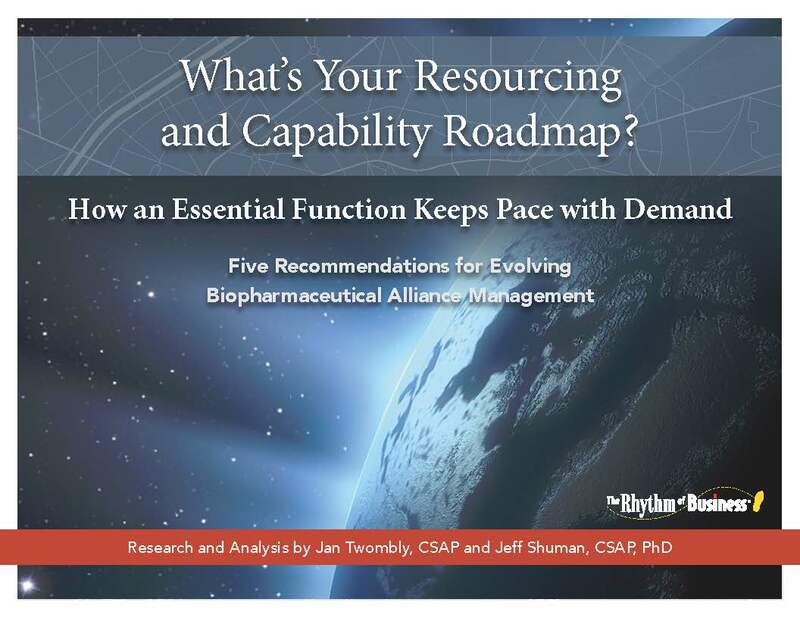 The Rhythm of Business has interviewed over 30 alliance executives from a wide-range of biopharma, biotech, and animal health companies to understand and report on the current state of practice. Our core finding is that alliance management is here to stay in biopharma. It is viewed as a strategic capability, essential to the organization, with increasing C-Suite visibility and support. 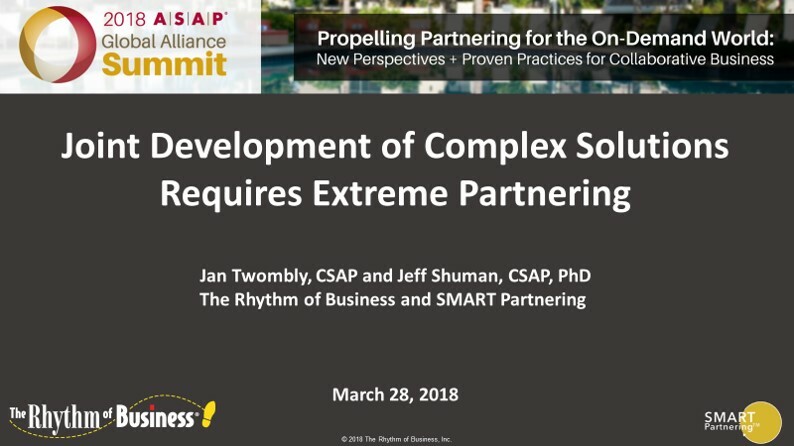 This presentation given at the 2018 ASAP Global Alliance Summit by Jan Twombly and Jeff Shuman introduces our methodology for partnering at the speed of business by creating a Minimum Viable Partnership (MVP). We use a why, what, how value framework to shape the alliance business model and infuse the process with a focus on learning fast what works and what doesn't work. Tips and techniques for addressing intellectual property in joint solution development are also included. Can a 'Dinosaur' Dance in Its Fourth Industrial Age Ecosystem?